I generally have a package or two of artichoke hearts in the freezer, and use them to create quick dinners on days when my cooking inspiration is on strike. 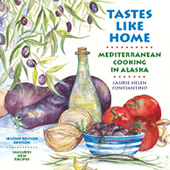 Tastes Like Home: Mediterranean Cooking in Alaska has three recipes in which artichoke hearts play a starring role: Artichoke and Dill Egg-Lemon Soup, Artichoke Pilaf, and Artichokes Braised with Dill. Paired with a crisp salad, any of these dishes makes a filling vegetarian meal. 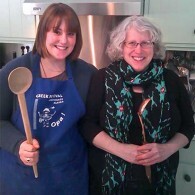 Of course, any recipe calling for artichoke hearts will taste better if it’s made with fresh artichokes. But using fresh artichokes just for the hearts requires too much time and effort (and costs too much) for quick mid-week meals in Alaska. I’d rather save fresh artichokes for steaming whole or grilling or stuffing; uses that allow me to enjoy the delicious leaves (which too often end up in the garbage when fresh artichokes are used for their hearts). 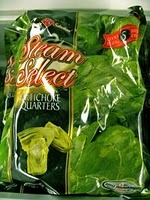 iwnt to buy frozen artichokes where can i find them? I’ve been able to find frozen artichokes at large supermarkets and in specialty and ethnic groceries. Good luck!